We all love to change those boring ringtones once in a while. To make matters worse, iPhones come with that popular song and you are not allowed to change it, you aren’t even given the chance to use the song of your choice. I’m sure many people out there are craving for their own ringtone, something that’s got their own feel to it. So if you want to make your own ringtone (a new one like new ringtone 2018 in fact) and don’t know if it will be possible or not, I’m glad to tell you that it is totally possible to make your own ringtone. If you have your own iPhone and can't set your favorite ringtone, this is terrible. No one wants to use the same ringtone as anyone else, but to make their own unique ringtones. If you are looking for ways to make free ringtones, you are in the right place. 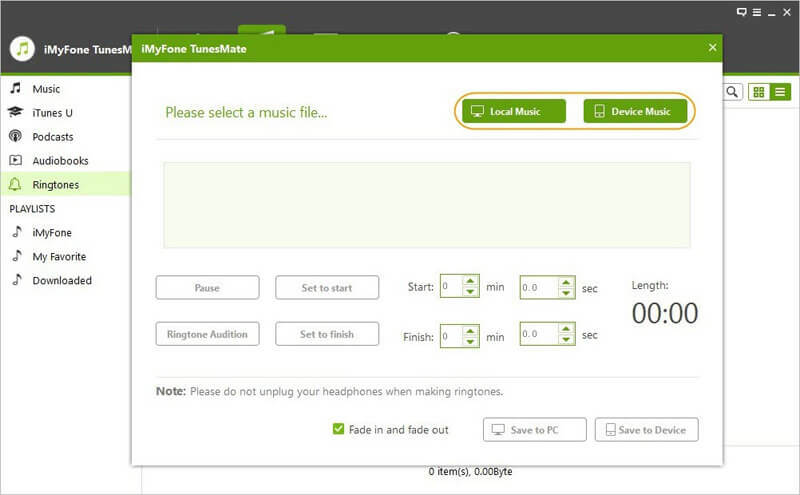 With iMyFone TunesMate , you can make new ringtone easily and manage them better. Also you can manage your other media files with its help. New ringtone 2018 is waiting for you. Freely make your own ringtone for you iPhone in just simple steps without any hassle. 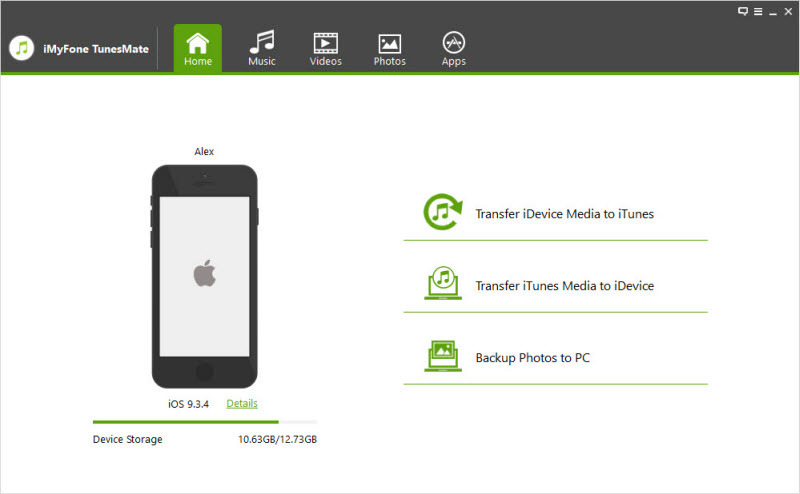 Conveniently transfer you media files like music, videos between iPhone and computer or iTunes. It can transfer you media files selectively or in a all-at-once way with easy operation. It can sync your iTunes library to your iOS without overwriting the previous data. You can share your music, videos and photos with different iOS devices even with your friend. Step 1: The first thing to do is to connect your iPhone to your computer through the USB cable and then launch iMyFone TunesMate. Step 2: Once you’ve connected your iPhone to your PC, the next thing you do is click on the tab that rings “Music” and then goes ahead to select “Ringtones” and then the “Ringtone Maker”. Step 3: Browse and select a music from your iPhone/Computer. You can choose music file by clicking on “Device music” or “Local Music”. Step 4: You can make use of the light-grey area on the software’s interface that is if you are still interested in manually picking your favorite part for the Ringtone. Step 5: Once you’ve set the start time and time stops of your ringtone, you can then use “Save to PC” options to save the ringtone to your computer or “Save to device” option, with this, you will be able to save the created ringtone on your iPod, iPhone and other iDevices. What Else Can You Do with iMyFone TunesMate? Manage Your Music - One of the major features of the is that it helps to manage your music properly. Speaking of managing, the iMyFone TunesMate can help you transfer music from iPhone,iTunes, and your computer. Manage Your Photos - It also comes with the photo module, just like music the iMyFone TunesMate can also help manage your photos, like transferring it from iPhone/iPad/iPod touch to your computer. 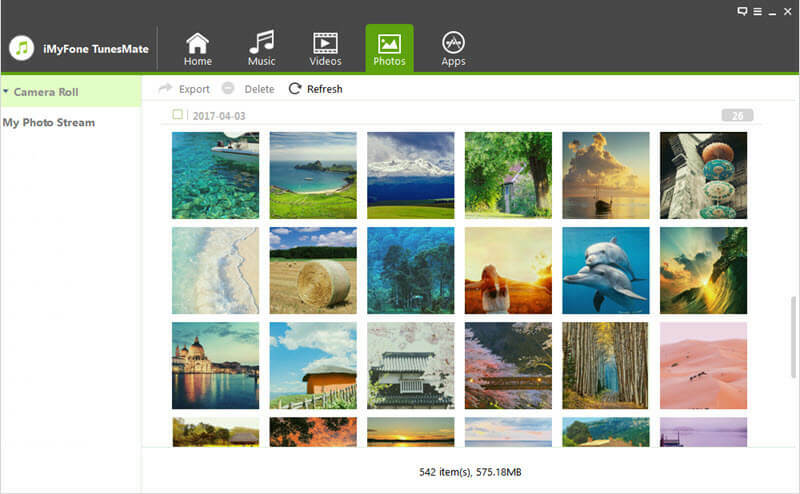 It allows to transfer or receive photos in one click. 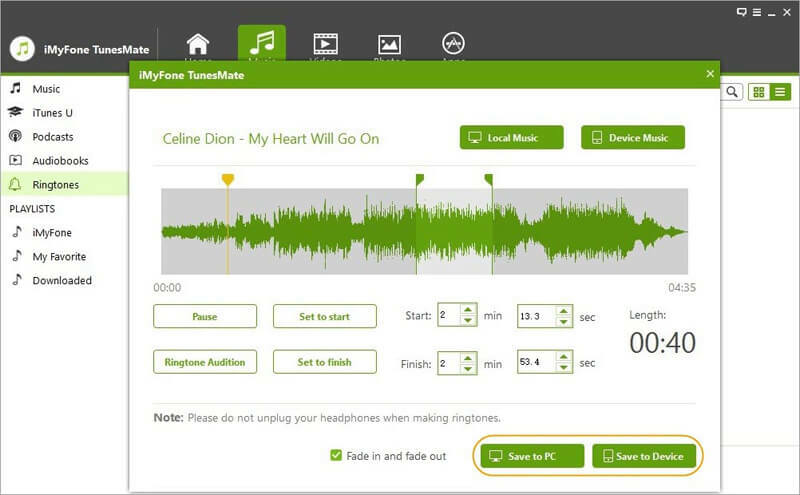 Manage Your Video - The iMyFone TunesMate can also make it very easy for you by helping you transfer your videos from your iPhones, iPod to your computer, videos that include Music videos, TV shows, Movies, and Podcasts. After customizing your own ringtone, it is time to transfer them into your iPhone to make it your own ringtone, the iMyFone TunesMate will help you transfer these tones into your iPhone in no time. All you have to do is drag and drop or select files with very few clicks. 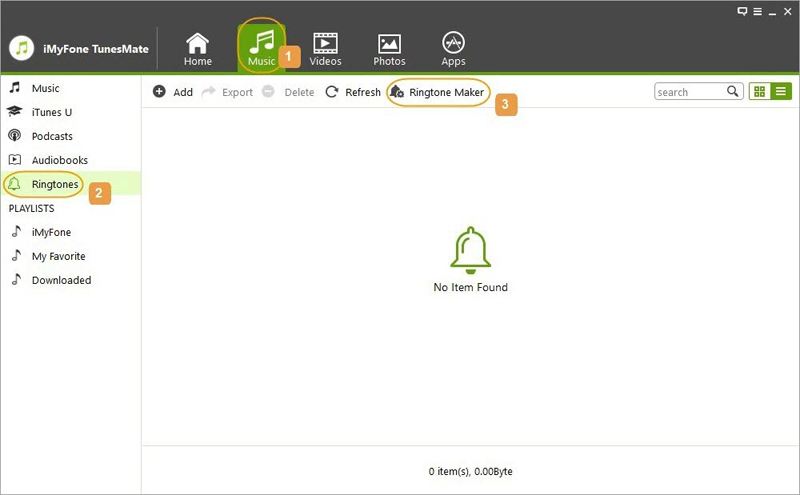 It is not just from your computer that you need to transfer music to your PC, you can use the TunesMate to transfer Music from iTunes Library to your iPhone. The Audio files include Music, iTunes U, Audiobooks, Podcasts, and playlists. All in just a few clicks. Step 1: The first thing to do is to launch the iMyFone TunesMate on your computer and connect your iDevice using a cable. Step 2: First, click on the “Music” tab right there at the top bar, you will be taken to the “Music” windows by default. 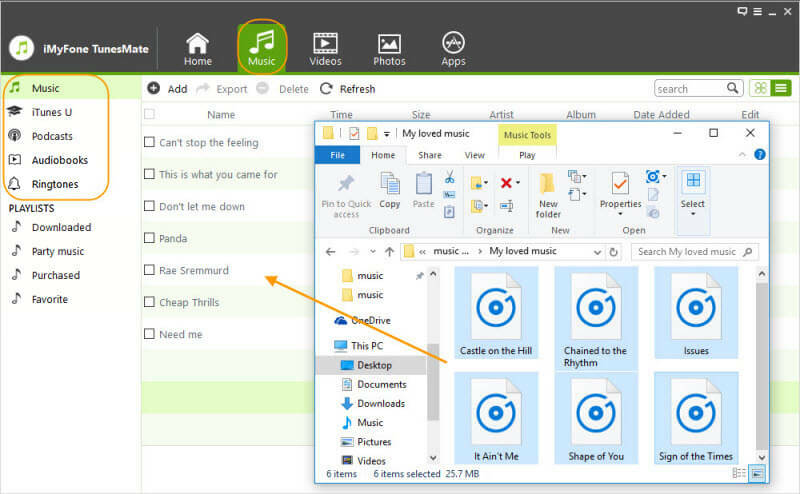 Step 3: Tap and then Add file folder to transfer the music from your computer. Step 4: The next thing to do is to click on the open to transfer from your computer to iPhone. Step 1: First of all, you will have to open your iPhone and then click on the “Settings” icon. Step 2: Now that you have opened the settings, you should locate the “Sounds and Haptics” and select it. Although it might be “Sound” for some versions. 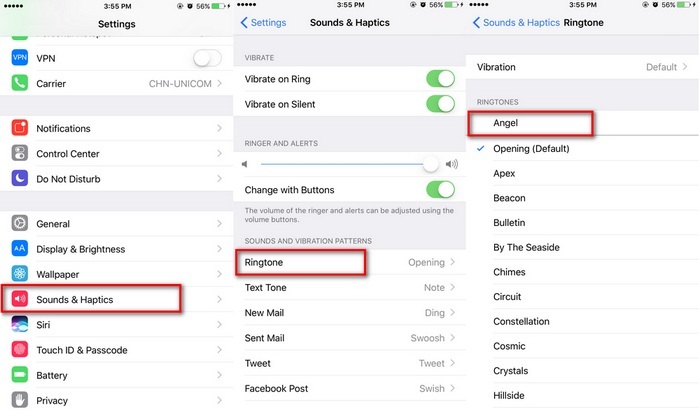 Step 3: Next, scroll down to “SOUNDS AND VIBRATION PATTERNS” section, and select “Ringtone” to enter the ringtone list. Step 4: The Final step includes picking a song from the list and making it your selected ringtone. What are you waiting for? Make your own ringtone for your iPhone now!